You'll need to cut 2 of each of these pieces (click on the pic to enlarge it to a readable size). The measurements are in centimetres because that's the way I was brought up (sorry). 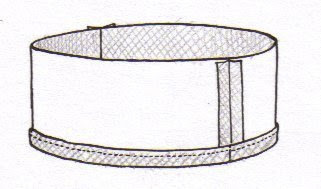 A seam allowance of 1cm is included in these measurements. Zig-zag the top edge of the smaller lining piece. Turn the smaller one right side out, the bigger one wrong side out, and put the bigger one inside the smaller one. Match up the corners and the side seams, then stitch them together along the top edge of the smaller one. Hem the bottom edge of the outer sleeve piece, turning up 1cm all round and stitching it down. Almost done, except for the fiddly part! Turn the whole basket inside out, pull the outer sleeve out, fold it down along the seam line, and topstitch along the top edge. (This makes sense when you do it - not so much in your head, trying to imagine it.) The topstitching isn't crucial, but makes the next step easier. Matching up the side seams, pin the outer sleeve to the lining. Now stitch from the top to as far as you can get towards the bottom, on each corner. This is the fiddly part, by the way. Mark and pin in any way that seems sane to you: disappearing pens or chalk are good. If you used the same measurements I did, the card should be about 14 or 15cm by 11cm; cut slightly bigger than you think, and trim down. Still a sturdy basket, and almost just as neat. Play around with heights and widths for different uses; make the lining and outer from the same fabric, just doubling the height measurement for the larger lining piece. Let me know if you try this and if it all works sensibly. And if you think of ways to simplify the pattern, please do let me know! You're welcome to use this tutorial to make things to sell, too. A link back here or a mention would be appreciated, but I do realise this isn't rocket science or gene splicing and I can't claim any great originality, except perhaps for the extremely washable nature of these baskets. And even then.... my mom (of course) had something like this, made in China when that was still an exotic thing. Oh wow. Thanks for blogging! I have just started a craft club with some creatively challenged friends here in Oslo and this looks like a great 2nd project for us!! Love these and will have to try making them. I've needed an odd size basket for a bookshelf and this is the perfect project! Thanks for sharing! I might just try making one! Love it. I will definately try it. I was wondering how you would make one that does not have a square base but is wider than deep. oh, this is exactly what i've been looking for! i need to make some baskets for my nursery, and wanted to make them reversible and washable, and the interfacing kind didn't seem like they'd work. brilliant! thank you! Thanks for the tutorial. I will definitely be bookmarking this! Thanks Jesse, I will definitely try this! Funny how the wire sculpture in the first picture actually looks like a doodle made on the image. yay! I am so, so excited about this! Thanks so much for the very detailed details. =) You rock! I'll be linking. Thanks so much for this Jesse. I am very tempted to try it out! Thanks for this tutorial, it realy roks!!! Thank you for this - these look great I must have a go at making one. I'm in awe at your incredibly neat step-by-step drawings. Thank you very much for the wonderful tutorial jezze!!!! cant wait to make it soon. Lovely fabric too! I have been looking everywhere for a tute like this, thank you sooooo much. Now I can make some for my bookcase. LOVE this! Saw it on HowAboutOrange. I've been desperately wanting some baskets to hold all of my bathroom crap, but didn't want to go wicker or plastic. I see a project in my future! so funky!! i love the print. maybe you can use the scizzor print on the box as well? dit sal so cute lyk!! op die nate. Thanks for measurements in cm. Brilliant, thanks for this, I'm going to have a go this afternoon. I love this! 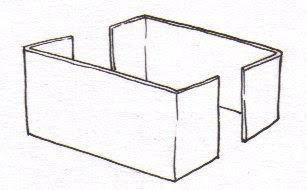 This tutorial is so timely and wonderful as I just bought new shelves to keep some of our ever increasing clutter and now fabric boxes to keep them in. Thank you for being so generous!! I linked to your tutorial on my little bloggette: http://mamela316.blogspot.com/2010/03/mals-closet-craft-tote.html (let me know if that's not okay) Thanks! wow!! this is brilliant. thanks heaps for it. I am going to try it out right away. love your instructions, your pics and you have a new follower. BTW NEVER apologise for using metric measurements, most of the world uses them and they are more logical oce you make the adjustment. I can't say with any certainty, so the best thing is going to be for you to experiment, I'm afraid. Acrylic paint doesn't wash out easily, but can make the fabric hard - and it's these hard bits that show wear and washing badly. Are there any silkscreening businesses near you? Small T-shirt printing companies might be willing to sell ink, and it's pretty similar to fabric paint. Thank you for your quick answer :) I will try it and let you know if it worked. Thanks for the silkscreen ink advice, though. I think I also might buy them online. They are much budgetable. Thank you so much again. Ezgi. Great tutorial, I might whip some of these up for storage in my son's bedroom, thank you! Another great idea! These look much cleaner and more modern than the round variety. Thanks for sharing! Thank you! And for making them in cm's especially! Nice to "meet" a fellow Capetonian, even though we're in NZ for a little while. I do miss CPT. Thanks for the tute. Can't wait to try it out! Great idea, but I'm a little confused. You say to turn the lining pieces right side out, and then slip the cover over that, and sew wrong sides together. Not possible if the outer piece is placed over the right side out lining pieces. Seems like the outer piece should be placed inside the lining pieces, wrong sides together, then flipped out over the lining pieces, and topstitched down. The cardboard is placed up under the outer pieces, right? Sorry if I'm totally off here, I'm trying to wrap my head around it! This is such a great idea for baskets and I want to try! Whoops! Looking at my drawings (which are much more accurate than my written instructions), I think you're right. It should read 'Right sides together' - I've fixed the text. Thank you!!! This is amazing. I'm going to have to make these for some clutter keepers! Appreciate it greatly! I'm glad you figured it out in the end! Adding colour to the pics is a skill I still need to learn, but it's a good idea, and I'll have to give it a try. Thanks for the tutorial. I'm going to have a go making these tonight, what weight of fabric would you recommend? Anything that's not very lightweight should be fine; I used a mediumweight cotton, and upholstery weight should work well too. Hi I have been going to make these for a few years now! And finally today made them! :) Will make some different sizes down the track! I found the instructions easy and I'm not a great sewer!! Thanks so much!! I hope to blog it tonight!!! I love this idea. It's super cute and super practical. I just have a major question... What do you mean by card? I'm not well versed in the fancy terminology for things when it comes to sewing and the only card I can think of is card stock paper or cardboard. (Neither of which seem washable in my opinion.) Can you clear this up for me please? You can use any thickish cardboard - it doesn't have to be washable because you can take it out before washing. The card simply slips in and out of the pockets you make on the sides of the basket. Ok, it took me a while to figure out some of the steps (I was confused as to what part was lining and what was outer sleeve, etc) but I LOVE this! Now that I've figured it out I will quickly make loads more! Thanks so much for posting such a useful tutorial! 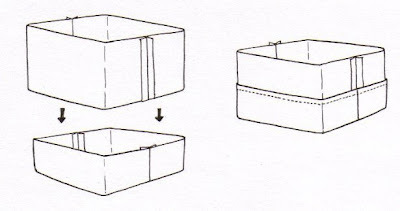 Fantastic tutorial-now to get to sewing those fabric storage boxes.. Thank you for this tutorial. I made my own version from only two pieces. Visit my blog to see some pictures (my blog is in finnish). I love it that you said the pattern was marked in cm, because that's the way you were brought up. It made me smile. Here in the US, over 40 years ago, they were telling us were going to use it too. They should have switched then and made it easier for all in the world. Shouldn't be a problem if we know how to use a ruler. Hi, thanks for posting up this tute! I am a newbie at crafting, so am gonna try this out soon. 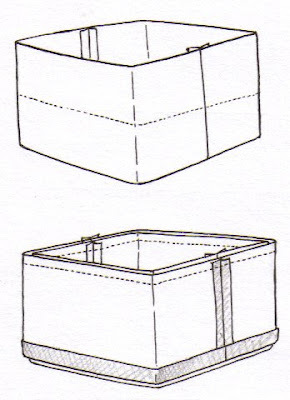 The idea is that there should be no raw edges left exposed, so the shorter lining is for the inside of the basket and the longer one for the outside, if I remember correctly. It has been a while since I made this - but give it a go with a paper mock-up, and you'll soon get your head around it! I just made one with old used fabric to try and the instructions are perfect! Thank you so much for such wonderful instructions! This is a great tutorial cannot find storage for all the toys in the right size! so why not make them... one question though the sides of this are stiff but not the base? Can a fabric covered insert just be stuck in there or have you got some sneaky way of adding another pocket for the bottom too that I missed? I am going to use stiff foam from a craft store instead (I've used it before to make dolls furniture) because I don't think cardboard will withstand the wrath of a child at play! Am loving the washableness! I'm afraid I don't have a sneaky way to add a pocket to the base! I didn't think of stiffening the bottom, as mine just stand on a table, and don't get moved around a lot. But I think just popping a fabric covered insert in the bottom should work. If you come up with a nifty way of doing it, please let me know! I made your basket and I love it! I also used your formula to make a bigger one and I found that there is an error. 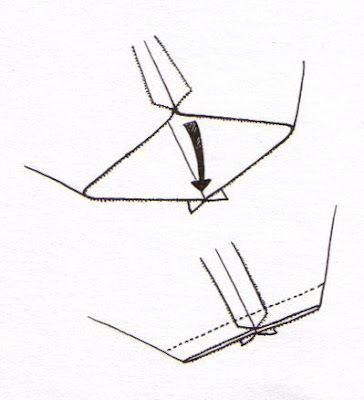 On the sides of the linings you have "y" but it should be "y + 2" to also account for the seam allowances. I noticed that before I cut my pattern out so not a problem for me. 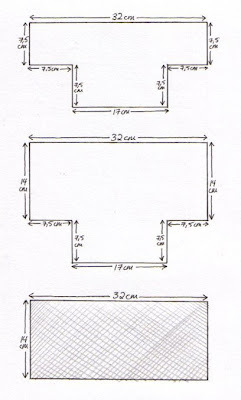 This seems simpler than a couple of other fabric box tutes I've seen, so I'm going to Pin it and try it. I have some plastic canvas that I got at a garage sale or something to use instead of cards. A little stiff and totally washable! Joy: Thanks for that! I've edited the tutorial with a note about seam allowance. Holly U: Plastic canvas will be perfect! Okay, I made one last night from scraps as a test. Having cut my fabric wrong, I can clarify for those who have a specific look in mind: The smaller liner is the base, and only seen from underneath. 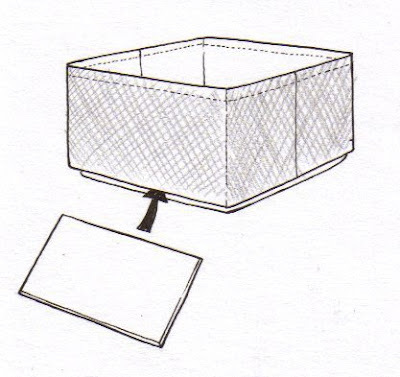 The larger liner lines the entire inside of the box and the rectangle is seen on the outside. So you could even use three separate fabrics, depending on the look you want. And if you do use plastic canvas, whipstitch the bottom of the opening so the canvas stays secure and you can just throw the whole thing in the laundry when needed. Thanks for posting this follow-up, and for clarifying how the bits fit together. Mine was square, but it's essentially the same as making a bag.... 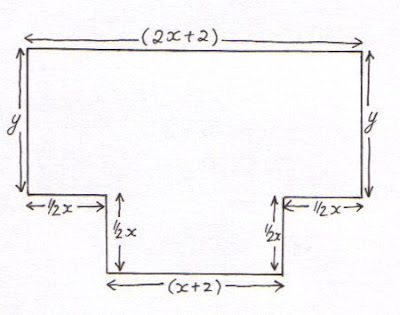 I might be confusing things here, but if you look at my first diagram, you'd replace 17cm with 11cm, and 7.5cm with 2.5cm, and 32cm with 13.5cm. Then don't forget to add seam allowance! Does that sound as if it will work? The instructions are clear and very easy to follow. I'm starting this project now. Keep in mind that you will probably acquire more objects throughout the years, and be sure that you choose a building size that you won't outgrow within the first few years. Thank you for posting this. It's super cute and super practical.SHG Foldable crate is a professional Chinese collapsible crate manufacturer Company. I think I've got it after reading a few times. 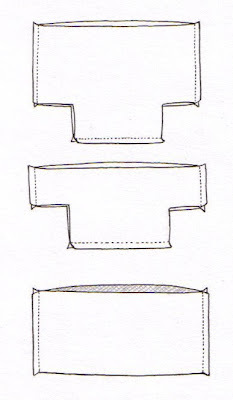 It would help to identify which piece is the lining earlier. Also use location words like "the corner at the bottom", "not sewn all the way down to the base"